Members of a Taihape brass band are shown at the local band rotunda, around 1912. 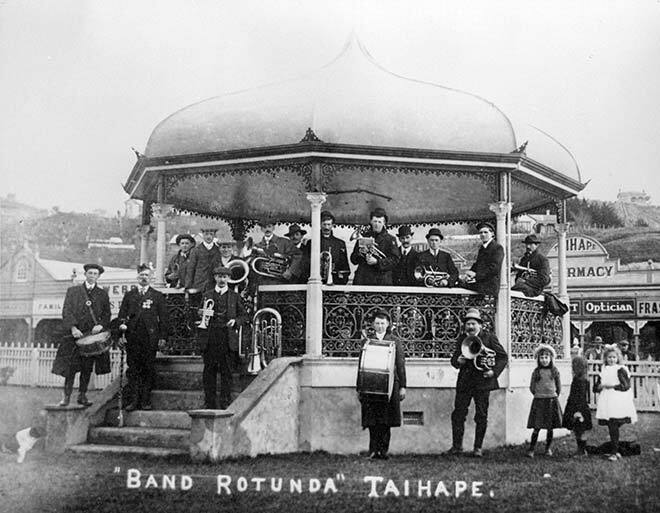 In the late 19th and early 20th centuries communities around New Zealand built band rotundas, which served as both sites for public entertainment and marks of civic pride. The Taihape Coronation Band Rotunda was completed in 1912, commemorating the coronation of George V in 1911. The rotunda was financed by a combination of government funds and community contributions. The photo is probably of a band practice, as the members are not wearing their uniforms.